Teeth grinding is a surprisingly common occurrence and often happens whilst asleep. Most people are therefore unaware that they are grinding, and only come to realise it when their partner complains of the noise the following morning. The most common reason for grinding is when we try and compensate for an imperfect bite. This is when the upper and lower jaw come together but the teeth don’t seem to fit comfortably, and you try and force them into a perfect bite. Imagine chewing hard but with no food in your mouth. It is also thought that stress can lead to grinding, although you may be equally unaware that you are doing it, as it often happens during your sleep. As you try to compensate for the imperfect bite, you end up biting harder, causing damage to the enamel on your teeth. It becomes a vicious circle, as you bite harder to try and make the teeth fit better. However, you end up creating more damage to your teeth, by initially wearing down the tooth’s enamel, and gradually wearing down the tooth itself. 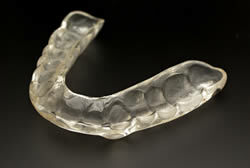 As most grinding occurs during your sleep, the most common solution is the use of a mouth guard to prevent such grinding. This helps to reduce the pressure of teeth grinding, and helps prevent further damage to your teeth. Your dentist may also be able to make adjustments to your teeth, in order to achieve a better bite, and thus reduce the subconscious effort you are making. Naturally, if your grinding is a result from stress, then you should learn relaxation techniques and stress management.